What does it mean, to hold somebody at gunpoint? It’s about power: demonstrating control. But it means something else, too: vulnerability. Perhaps a third party is packing, and will put a bullet in your back. Maybe you’ll hesitate, and be overpowered by an enemy with the will to do what you will not. Power and vulnerability. 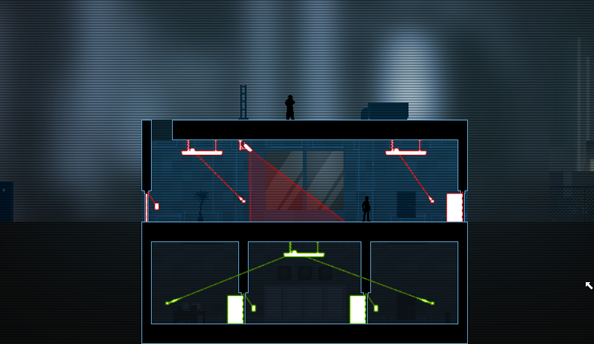 To play Gunpoint is to dance in the space between both – though you may not pull a single trigger. 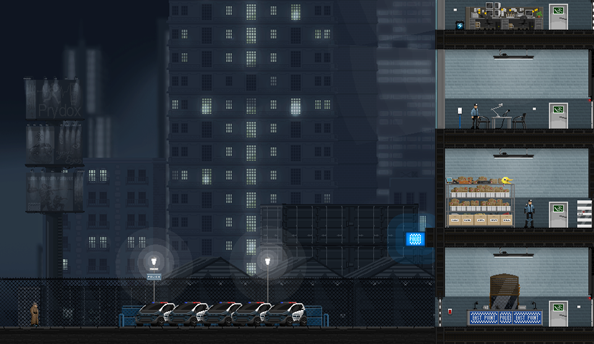 Gunpoint is a 2D stealth-puzzle game that begins with a defenestration and doesn’t ease up on the windowpane hate crime thereafter. You play as hire-a-spy Richard Conway, who finds himself chief suspect in a murder case. He didn’t do it, obvs. Over the course of the game, you’ll be hired by various involved parties to retrieve or destroy delicate data related to the case. 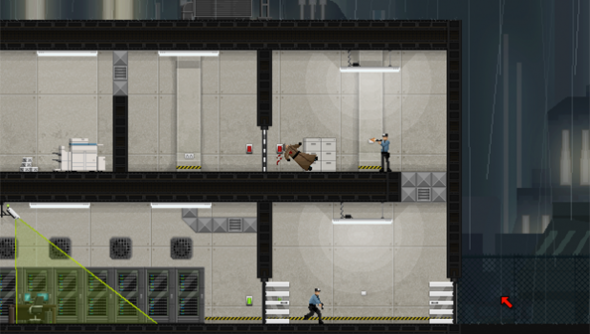 Missions present you with a tall building to master (though later levels increase the complexity with two or three adjacent offices) and ask you to traverse a maze of alarms, locked doors and armed guards to reach your goal. To get about these places, you’ll need to channel Sam Fisher via Spider-Man. Sucker pads allow you to cling to walls and ceilings, as much pathways as the floors. And thanks to a ridiculous Amazon-ordered contraption, you’re able to fling yourself great distances at high speeds – absolutely the best part of Conway’s job. Guards will kill you more or less instantly if they spot you, which is where the vulnerability comes in. Thankfully, while pulling off your plans often requires finesse, you’ll find plenty of spots to pause and ponder your next move. That’s how you’ll manage to surprise the buggers. In Gunpoint, ‘surprise’ means pouncing on a man when he’s not looking and biffing him in the face. Punch once to knock him unconscious. Punch again, and again, and again to pulverise him, eliminating a witness and providing your dry cleaner with more work. Once the mission’s done, you’re marked on your performance via four meters – Violence, Witnesses, Noise, and Time. Different employers will have contrasting ideas as to what entails a job well done. The low-level analyst in a fix who types in all-low-caps would prefer minimal violence, for instance, while the CEO of a ruthless gun corp would rather you leave no living witnesses. With a little creative interpretation, however, neither will require you to compromise any self-set limitations you might choose to set yourself. Gunpoint is that sort of game. The plot is unravelled in a series of faux-IM sequences between missions – a cheap and clear alternative to the uncanny, swaying 3D faces we usually have as witness to our conversation trees. Your exchanges with your clients are often silly, and allow you to chuckle at the glibness of some of the suggested responses without necessarily choosing them. It works so well that I’m astounded it hasn’t been done before. Anybody who grew up with MSN Messenger knows the emotional power of a sudden disconnection. Somehow, the second-or-so’s pause it takes for your client to reply is enough to convince you of their humanity – though they consist of nothing but lines of a text and a static pixel art image. Especially impressive are the moments when the comedy gives way as the stakes are raised. In one particularly grim mission briefing, I became suddenly aware that a character’s fondness for unnecessary exclamation marks had caused me to invest in her completely. That realisation defined the course of the rest of the game. Oh yes – conversations sometimes offer you the chance to steer the story yourself, too. But be warned: the major choices aren’t telegraphed with awooga alarms the way they tend to be in BioWare RPGs. And while Gunpoint’s tale may be small-scale, it has big, clumsy consequences. The game’s most juicy options are to be found in crosslink mode, however. With a tap of the middle mouse button or the ALT key, a blue-hued overlay supplants the exquisite charcoal greys and dingy browns of the usual game world. It’s here that you’ll find an invisible network of electronics, ripe for inventive rerouting. You’ll soon learn that a lightswitch is your most powerful weapon – the only thing you need to go bump in the dark, or force others to do the bumping around for you. You might wire a lift call button to the lights, for example, so that the guards are plunged into darkness the very moment you hit their floor. Or rewire the switch – so that the man who heads instinctively to it when things go dark instead opens a locked door that stands between you and your target. Smug satisfaction guaranteed. Much like its technical inspiration Spelunky, with which it shares a toolset inGameMaker, Gunpoint is a serious contender for long train journeys with the netbook. It ran consistently at a smooth 60fps on my measly work laptop: an Acer Aspire 5750. It’s also quite short. First-time developer Tom Francis ballparks it at around three hours, though I’m convinced it took me closer to five. Given the current $9 price point and the quiet density of those tiny levels I’d say that’s about right, but if you’re somebody who likes their games to last them all week, well: this won’t. There’s certainly more lateral headspace waiting to be explored here – and with any luck, the included level editor will see that it is. What’s already here is an unmitigated triumph, though: a game which secretes player choice into its dialogue and comedy into its second-to-second sneaking. 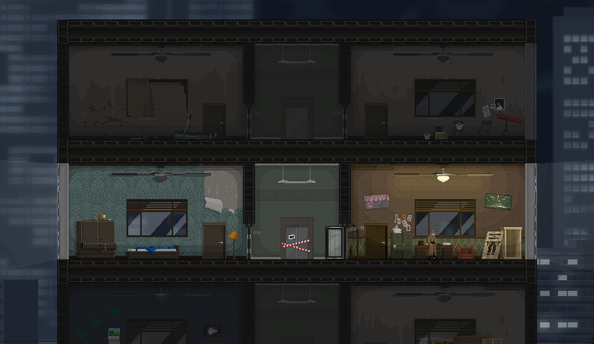 A game in which you’ll spend half your time jumping through plate glass to execute ingenious plans, and the other half clinging to the wall, watching a lift ping dumbly between floors in an infinite loop of your own accidental devising. It’s clear that Francis is a disciple of Deus Ex and the immersive sim – that beloved subgenre in which the player overcomes great odds using stealth, wiles, gadgetry; by exploiting a great deal of options and dancing in the space between power and vulnerability. With Gunpoint, he’s tackled a tough question head-on: how can we translate those values and mechanics into something a little more affordable? When you’re dangling from the ceiling of a police station, wondering whether to drop heavily on the officer below, knock him out with an automatic door or simply slip past him in the darkness, you’ll know the answer can be found in Gunpoint. 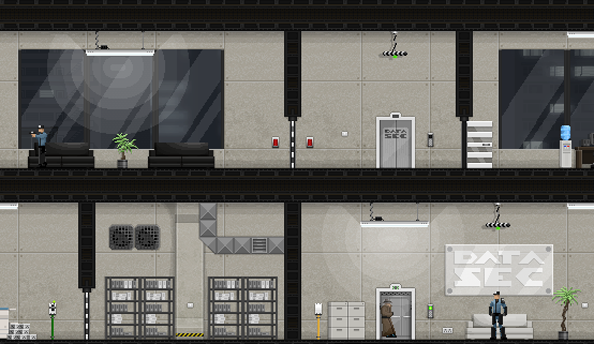 But remember: where Deus Ex is conspiracy-thriller, Gunpoint is conspiracy-farce. 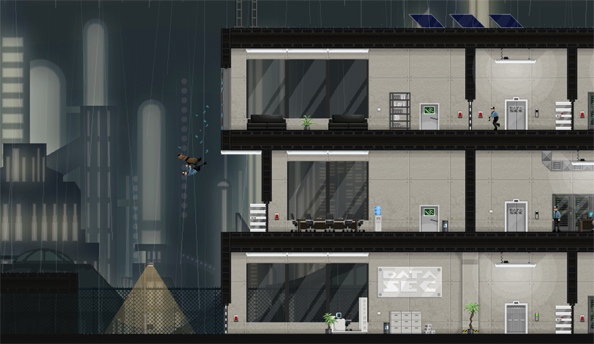 You’ll know its true sensibilities when, after pulling off the perfect heist, you overshoot your jump to the subway below and land not with a stylish Avengers ground-pump, but with a full-on faceplant. It would’ve never happened to Chell.